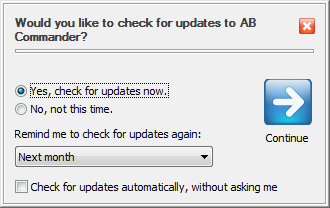 You can choose how often you want AB Commander to remind you to check for the updates (daily, weekly, monthly, or never). You can also set up AB Commander to check for the updates automatically, without asking you. Note that you may need to configure your firewall, anti-virus, and/or anti-spyware software to allow AB Commander to connect to the Internet, otherwise it may not be able to receive the information about the updates.